The 2006 NFL season had ended in bitter disappointment for the San Diego Chargers, who put together the league’s best record at 14-2 but lost their only postseason game – a Divisional round contest against the New England Patriots. 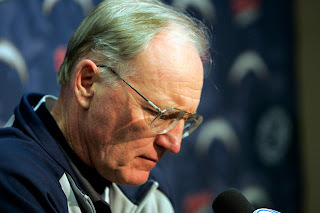 Several weeks later, on February 12, 2007, they took the step of firing Head Coach Marty Schottenheimer. Two coordinators had already left to become head coaches (offensive coordinator Cam Cameron became head coach in Miami and defensive coordinator Wade Phillips moved on to the head job with the Cowboys) and two more assistant coaches left as well (tight ends coach Rob Chudzinski became offensive coordinator of the Browns and linebackers coach Greg Manusky moved to the 49ers as defensive coordinator). Schottenheimer had one year left on his contract, and was owed $3 million. He had turned down an offer for an additional year at $4.5 million three days after the playoff loss to the Patriots, which had apparently angered Spanos and Smith. Smith had been promoted to general manager in April 2003 following the death from cancer of his predecessor, John Butler. Disagreements over personnel moves, such as QB Drew Brees being allowed to leave the club as a free agent, played a role in the rupture between Smith and Schottenheimer. The 2006 Chargers had gotten off to a 4-2 start before winning ten straight games to close out the regular season. They were the league’s highest-scoring club as they scored 492 points and 59 touchdowns while on defense the Chargers led the NFL with 61 sacks. Top players on offense were QB Philip Rivers, who stepped up admirably in place of Brees; RB LaDainian Tomlinson, the consensus league MVP who gained 2323 yards from scrimmage and also set a new season scoring record; and TE Antonio Gates, who topped the receivers with 71 catches for 924 yards and 9 TDs. The key defensive players were NT Jamal Williams, linebackers Shawne Merriman and Shaun Phillips, and CB Quentin Jammer. Specialists were also strong with Pro Bowl PK Nate Kaeding, who missed only three of his 29 field goal attempts; punter Mike Scifres, who had 35 punts end up inside the 20 as opposed to just two touchbacks; and long snapper David Binn, another Pro Bowl selection. The ability to turn teams around and win consistently had been signatures of Schottenheimer since he first became a NFL head coach with the Cleveland Browns during the 1984 season. The Browns went 44-27 under his direction with no losing records. Moving on to the Kansas City Chiefs, the club went 101-58-1 and didn’t fall under .500 until Schottenheimer’s tenth (and final) year at the helm. In one year in Washington, the Redskins were 8-8. His 200-126-1 record during the regular season was the most successful of any coach not to reach the Super Bowl. However, the pattern of falling short in the postseason also became a part of his legacy. To be sure, the Browns came within a John Elway drive and ill-timed Earnest Byner fumble of advancing to the Super Bowl following the 1986 and ’87 seasons, respectively. But his teams were a combined 5-13 in the postseason and the loss to New England was his sixth straight in the playoffs, thus exacerbating the negative impression. On four occasions, his teams had entered the postseason with the best record in the conference (1986 Browns, 1995 Chiefs, 1997 Chiefs, as well as the 2006 Chargers). A defense-minded coach (he had played linebacker, coached that position for three teams, and was elevated from defensive coordinator in Cleveland), Schottenheimer’s teams were known for utilizing a power-running attack on offense and attacking style on defense that yielded many sacks and turnovers. Even while updating to an offense that went to the air more often, he still never strayed far from the running game. To succeed Schottenheimer, the Chargers went with Norv Turner, who brought a 58-82-1 record from his previous head coaching stops at Washington and Oakland and had most recently been offensive coordinator in San Francisco. Recognized for his prowess as an offensive assistant, he had yet to achieve success as a head coach. With Turner at the helm, the Chargers topped the AFC West in each of the next three seasons, going a combined 32-16, although in 2008 it took a late charge to win the division with a mediocre 8-8 record. They did win playoff games in 2007 and ’08, advancing all the way to the AFC Championship game in Turner’s first year. But after failing to reach the playoffs in the ensuing three seasons, through 2012, Smith and Turner were let go. The firing by the Chargers marked the end of Marty Schottenheimer’s NFL coaching career, although his name came up occasionally in rumors and he had success in one abbreviated year as head coach and general manager of the Virginia Destroyers of the United Football League (the Destroyers went 3-1 in the shortened 2011 season and won the four-team league’s title).